Giant jellyfish and mussels. Pallid shrimp, fish, and sea cucumbers. Never-before-seen octopus species. All these and more dwell in the deep sea, 200 meters (over 650 feet) and deeper beneath the ocean surface. It’s the largest habitat on Earth, but it’s also one of the least understood. As mining companies eye the mineral resources of the deep sea—from oil and gas, to metal deposits—marine biologists like London’s Natural History Museum’s Diva Amon are working to discover and describe as much of the deep sea as they can. Amon has been on dozens of expeditions to sea, where she’s helped characterize ecosystems and discover new species all over the world. And she says we still don’t know enough about deep sea ecology to know how to protect these species, the ones we’ve found and the ones we haven’t yet, from mining. But accessing the deep ocean is expensive; it can cost anywhere from $50,000 to $100,000 a day to run a research ship. So roboticists and artificial intelligence designers are developing underwater drones to map and sniff out the secrets of the deep with the help of sophisticated chemical sensors. These robotic explorers could someday hunt down sunken ships or planes, hydrothermal vents, and biological spectacles such as rare species or a whale fall, at a cost significantly cheaper than today. Nine teams of roboticists designing these underwater crafts are now in a race to win the Shell Ocean Discovery XPRIZE. In this segment, Amon and XPRIZE’s Jyotika Virmani join Ira to talk about the future of deep ocean exploration—and what we might find there. And Martin Brooke, team leader of Blue Devil Ocean Engineering at Duke University, will discuss his team’s plan for mapping the deep ocean: aerial drones that drop sonar-sounding pods into the seas, then reel them up and move them to the next target. Plus, explore some of the incredible sights of the deep sea from Amon’s expeditions below. 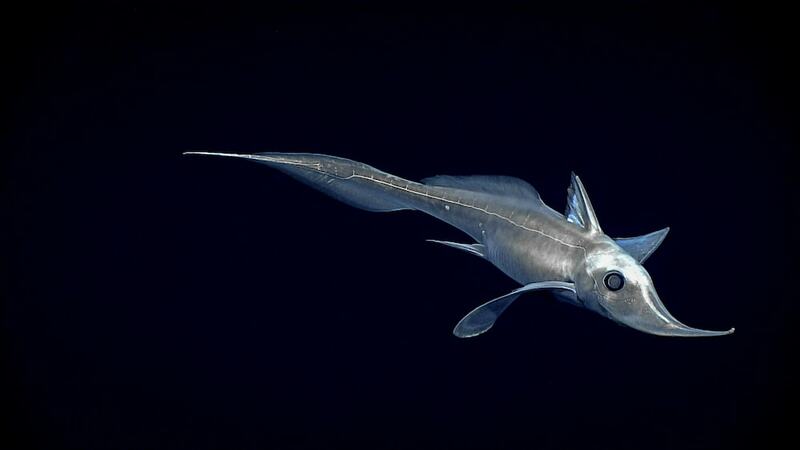 A longnose chimaera spotted during exploration of the Gulf of Mexico by the NOAA Ship Okeanos Explorer. Photo credit: NOAA’s Office of Ocean Exploration and Research. Diva Amon is a marine biologist and a research fellow at the Natural History Museum of London in London, England. Jyotika Virmani is the senior director for Planet and Environment at X-Prize, based in Culver City, California. Martin Brooke is an associate professor of electrical and computer engineering and team leader of Blue Devil Ocean Engineering at Duke University in Durham, North Carolina. IRA FLATOW: This is Science Friday. I’m Ira Flatow. It’s the first day of June, which means happy World Oceans Month, everybody. Here at Science Friday, we are celebrating science throughout the world’s oceans and meeting the scientists who study them. And today, we’re going deep, real deep, miles deep, where the water gets cold, the lights get dim, and the creatures get really weird, where hydrothermal vents nourish animals with chemical energy instead of sunlight and photosynthesis. 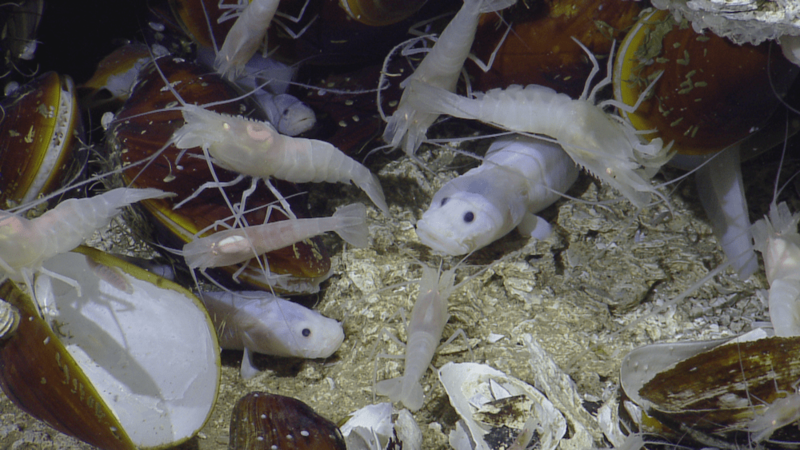 These deep-sea habitats are some of the least explored places on Earth. But deep-sea vessels are sending back a few clues. Let me give you a few examples. Research vessels like the Nautilus and NOAA’s Okeanos Explorer are roaming the seas, sending down remote vehicles, capturing video, sampling the creatures of the depths. And these expeditions are routinely finding new species. We’ve got new jellyfish, octopuses, shrimp, crabs, giant sponges, and, of course, microbes. What could we find next? Well, that’s what we’re going to be talking about. Our number, if you’d like to join us 844-724-8255. You can also tweet us @scifri. Diva Amon is a marine biologist and research fellow at the Natural History Museum in London. And she joins us via Skype. Welcome to Science Friday. DIVA AMON: Thank you so much for having me, Ira. IRA FLATOW: Are you excited about this month? DIVA AMON: I am so excited about this month. Anytime that we get to spread the word about our oceans is really a great time. IRA FLATOW: OK. Let’s define some terms first. And when you say the deep sea, where does that begin? At what level has become deep? DIVA AMON: So the deep ocean begins at about 200 meters depth. And, of course, it goes down to our deepest point in our oceans, which is just under 11,000 meters depth. IRA FLATOW: Wow. That’s a few miles, isn’t it? IRA FLATOW: I can tell you from past experience it’s miles. And you’ve been on dozens of expeditions to explore these places, including on the Nautilus? What does the modern process of deep-sea exploration look like today versus what it used to be? DIVA AMON: Oh, so OK, back in the day, the beginning of the 19th century, it sort of used to be mostly trawls. They’d throw a net off the back of the ship and just kind of drag it along the seafloor, see what it would bring up. And now, a century and a half later, we’ve moved into an incredibly high-tech time for deep-sea exploration. We use things like remotely operated vehicles, as you said. These are incredibly high-tech robots that can go down to the deep-sea floor. We can control them from the ship. They’ve got arms. They’ve got cameras. They’ve got different sensors. We can also use automated, autonomous underwater vehicles. And those we can just drop off the ship, and they can go and do our work for us without us having to actually be there with it. And additionally, there’s, of course, submersibles, where we ourselves actually get to go down into the deep-sea floor. IRA FLATOW: Yeah. And tell us what you see. Give us an idea of some of the weird– and I use that in a very good sense. DIVA AMON: Yeah, weird and wonderful, I like to say. DIVA AMON: So one of my favorites, the Hoff crab or yeti crab. And these are blind white crabs that live at hydrothermal vents. And they actually– the ones in the Southern Ocean, which are my favorite, have been nicknamed the Hoff crowd often David Hasselhoff from “Baywatch” because they’ve got a really, really hairy chest, which they use to farm bacteria by basking themselves in the warm waters that are chemical rich coming out of the hydrothermal vents. If that’s not weird and wonderful, I don’t know what is. IRA FLATOW: That’s pretty weird. It’s pretty weird. And wonderful, too. Never thought David Hasselhoff would be worked into that. But you did that very well. Why are there still so many places that we have not fully explored yet? You know, we always say that we know the surface of Mars better than the bottom of the ocean. Why is that? DIVA AMON: I mean, I know that sounds really cliche, but it’s completely true. 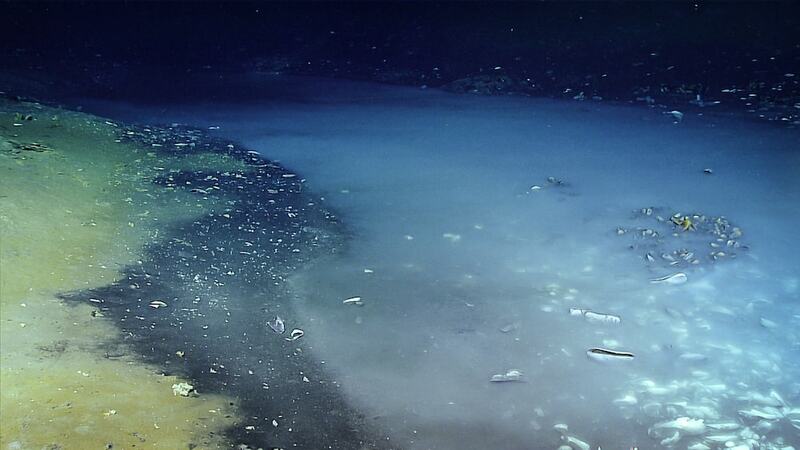 Over 99% of our deep sea has never been explored. And this is our own planet we’re talking about. And if we’re talking about mapping the deep sea, which I’m sure we’re going to get on to later on, our ocean floor has been mapped at a maximum resolution of 5 kilometers. So think about that. That means entire villages on land would be missing. Mountains would be missing. And so what does that say for the deep sea? And the reason we haven’t explored it is that it’s really difficult to do deep-sea exploration. It’s expensive, incredibly expensive. And it requires a lot of equipment, and it requires a ship and a lot of infrastructure. And, of course, it’s done in really remote places. IRA FLATOW: So I’m imagining there is still a lot to be found that we– some more of these weird and wonderful creatures that we’ve never seen. DIVA AMON: Absolutely. The census of marine life estimated that every time one explores below 3,000 meters depth, your chance of finding a new species is about 50%. IRA FLATOW: I know you’re joining us from Trinidad and Tobago in the Caribbean. And you recently went on a research expedition to explore the ecological communities of the deep ocean there. And I want you to tell us what you found. DIVA AMON: Yeah. So it was a couple of years ago now. But we went down. It was an absolutely amazing experience because, of course, I’m from Trinidad and Tobago. And so it was really, really special to me to actually get to explore my own country’s deep ocean, which, of course, we don’t have the capacity to do here because it’s so expensive and technologically and technically intensive. So the Nautilus, the EV Nautilus, came to Trinidad in 2014 and used their remotely-operated vehicles to go down into our deep seas. And it was the first time this was ever done using this type of equipment. 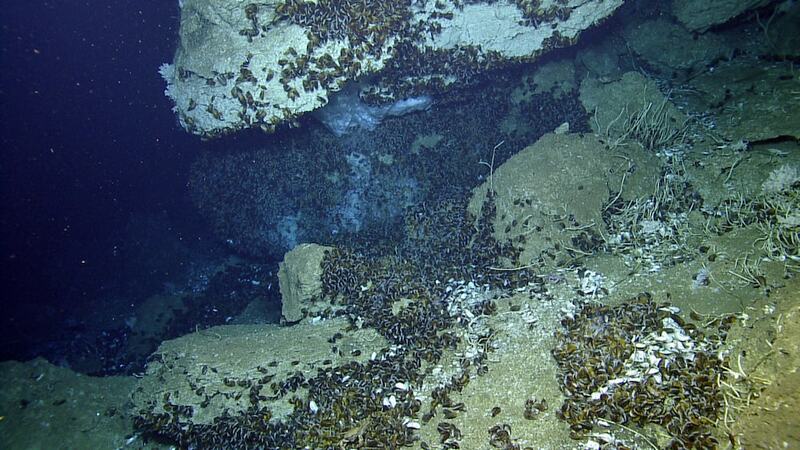 And we found the most– I mean, I guess I’m biased– but the most amazing methane seeps. And that’s basically an area of the seafloor where methane gas and methane fluids bubble out of the sea floor or seep out of the sea floor. And that methane and hydrogen sulfide is then used by creatures via chemosynthesis to make their food. They use the chemical energy found in these fluids to make their food. In a similar way to plants using sunlight via photosynthesis on land, chemosynthesis happens at hydrothermal vents and cold seeps and methane seeps in the deep sea. And so we found these methane seeps. And what they look like is just amazing. They’re basically as far as we can see, which, of course, isn’t that far because it’s pitch black down there. So we can only see as far as our lights will extend. But just millions and millions of mussels. And these are not mussels like what you and I would eat. These are mussels that are a foot long, OK? And when you bring them up to the sea surface, they stink like bad eggs, basically, because of the hydrogen sulfide. And apart from that, they had 3-foot-long tubeworms that were in bushes amongst these fields of mussels, and a bunch of new species, as well– a new species of purple octopus, which is yet to be described, a new species of sponge. It just was really fascinating. And again, it was really important because we don’t have the capacity to do that here, that kind of exploration. IRA FLATOW: What an awful job you have. Wow. It sounds– let me go to phones, to Renee in Cleveland, Ohio. Hi, Renee. RENEE: Hi, Ira. Thanks for taking my call. IRA FLATOW: Hi. Go ahead. RENEE: I was just wondering how does the landscape of the ocean floor that far down affect the ability to send things down there. It seems like even if you were to bump into something, it would cause catastrophic failure because of all of the pressures. So how do you overcome some of those challenges of just being that deep in that kind of an environment? DIVA AMON: Wow, that is a great question. So just like on land, the deep sea has a variety of habitats. It’s got everything from mountains to plains to canyons to trenches. And so you’re very right, very variable terrain. And so as a result, if we’re going to be sending down these really expensive pieces of equipment like remotely-operated vehicles, autonomous underwater vehicles, submersibles, which have people in them, then we need to map the seafloor before we do that. And we do map the seafloor, and in extremely high detail. It takes quite a while, but it’s what usually on scientific expeditions you will spend your first couple of days doing, mapping the area you’re going to be exploring. And then, of course, that will identify to you any potential hazards that may exist down there. IRA FLATOW: Wow. Well, as a scuba diver, I know that you can’t go down deeply and come up quickly because you’ll explode, you know? Is that what happens? How do you bring the samples back in any way that they’re not disfigured, so to speak? DIVA AMON: Well, sometimes that is not an option. They do have pressure chambers that you can bring many animals up in. But that’s not really used very often. So when you’re bringing up– I mean, most invertebrates– crabs, sponges, and so on– they tend to be fine. The change of pressure and temperature– because the deep sea is very high pressure and very low temperature– that change in pressure and temperature means that a lot of the animals, invertebrate-wise, will be dead by the time they get to the surface, which is great for me because that means I don’t have to kill anything. But the fishes are a little bit more complicated because they, of course, have swim ladders, which are full of air. And when you’re coming up to the surface, of course, things expand because of the decrease in pressure. And so that means when a lot of deep-sea fishes get to the surface, their eyes would have bulged out, and their stomachs would have erupted out of their mouths. And it’s just generally a really, really not pretty sight. IRA FLATOW: Yeah. All right. Let’s go back to Trinidad and Tobago. Your research, I understand, was expressly to characterize what’s there now because there’s oil and gas drilling that may begin off the coast soon, right? IRA FLATOW: So this makes your work urgent, before that all gets ripped up? DIVA AMON: Absolutely. So it’s kind of like this race against time, right? Race against time before things are impacted to a point where we may not know what is lost. So yes, here in Trinidad and Tobago– and it’s not just in Trinidad and Tobago. It’s around the world. Humans are running out of resources on land and in shallow waters. And because of the huge increases in technology, we’re now able to push into our deep oceans and get the resources from there. And that’s not only oil and gas. That’s food. That’s metals. You name it– pharmaceuticals. We can find it in the deep ocean. And so in Trinidad, our particular issue here now is that deepwater oil and gas exploration and extraction is due to begin this month. So that’s pushing ahead without us knowing what exists in most of our waters, Trinidad and Tobago’s waters. So it’s a bit tricky. IRA FLATOW: Hmm. And there are, like– there are not just oil and gas, but they’re also talking about metal mining because there are mounds of metal nodules down there? DIVA AMON: Yeah. So there are actually three types of resources where metals are really high-quality and really abundant in the deep ocean. And those, as you said, are nodules, polymetallic nodules, or crusts, which grow on seamounts or hydrothermal vents, those really special habitats that host huge abundances of animals in the deep ocean. And all of those harbor, as I said, really high-quality metals of various types. And there’s now this sort of push to mine them in the future. 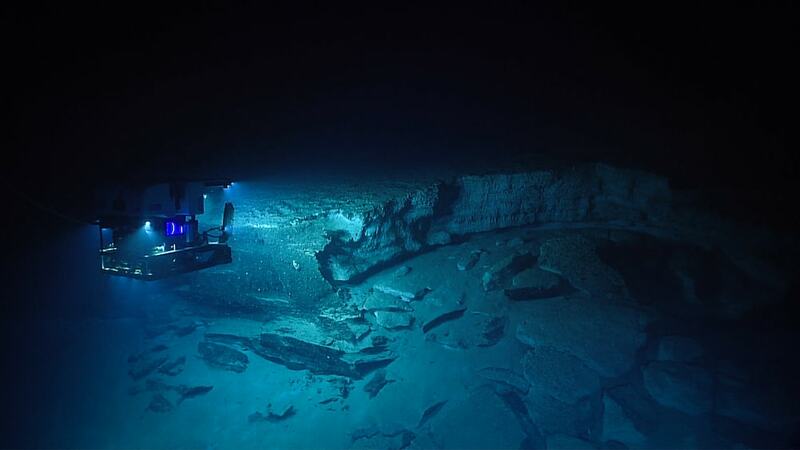 It hasn’t started yet, but within countries’s jurisdictions– so Papua New Guinea may start deep-sea mining as early as next year. But within international waters, where a lot of the resources are, that’s likely about five to 10 to 15 years away. IRA FLATOW: I understand that you’ve also done work in the Arctic. Are there unique species you found in arctic waters? DIVA AMON: So it was probably the Antarctic, not the Arctic. DIVA AMON: But I would love to work in the Arctic. Yeah, and the Antarctic– so that was actually the yeti crab that I talked about earlier is where that was found. And so I was one of the expeditions that explored the first ever hydrothermal vents discovered in the Southern Ocean. And it was just laden with these yeti crabs, as well as stalked barnacles that almost looked like car washes with their– you know, when you push the car through the car wash, and you’ve got the scrubbers that wash the cars. That’s what it looked like, pretty much. They were so laden with barnacles. IRA FLATOW: Wow. I’m Ira Flatow. This is Science Friday from WNYC Studios, talking about what’s under the sea with Diva Amon, a marine biologist and a research fellow at the Natural History Museum in London. Now, when I was in Antarctica many years ago, I saw people who were fishing for what I think they call the Antarctic cod because they were looking for the blood to see– they talked about in those days the antifreeze that was in the blood of the fish. But they would talk about stuff– because the shelf drops off right there, right? The continental shelf just dives right down. And so you can go really deep off that shelf and find stuff very deep underwater. DIVA AMON: Yeah. So that’s not just in the Antarctic. I mean, the Bahamas, as well. There are lots of places where the dropoff is actually really, really close to land. Kiribati, Bahamas, and so on. It’s actually just sort of a stone’s throw away, not as remote and far as you would think. IRA FLATOW: Yeah. So what would be your dream find? You talked about a muscular mussel you pulled up and some other really weird creatures– weird and wonderful, of course. What do you suspect might be down there that you haven’t found yet? Or is it because you haven’t found it, you have no idea? DIVA AMON: Oh, my. That is such a hard question. I’ve actually never thought about that. DIVA AMON: Yeah. This is a thing. Everything down there is already so weird. And you just wouldn’t even be able to think of these animals. It’s like evolution went totally crazy down there and just sort of mushed together things. I mean, a hairy-chested crab that farms bacteria on its body? Really? DIVA AMON: Oh, yeah. Yeah. IRA FLATOW: Was a glowing? DIVA AMON: It did look like it was glowing in the video. And so this was discovered by the Nautilus in 2016 off California. And it was, as you said, a purple orb. And all the scientists onboard were like, what is this? We’ve never seen anything like this. And let me tell you, that happens all the time when you’re doing deep-sea research. You’re constantly like, what is this? I’ve never seen this before. Is this new? And so they collected it and got it up to the lab. And when it was in the lab, it started to unfold. And they realized it was actually a pleurobrach, which is sort of like a sea slug. And because it was purple and found off California, they could pretty quickly tell that it was a brand-new species to science. IRA FLATOW: How do they tell? What is the process you go through to tell? DIVA AMON: So to say something is conclusively a new species, you have to collect it, which is, of course, one of the pitfalls with deep-sea science because a lot of the time, you’re just working with imagery or video. DIVA AMON: So you need to have the sample in hand. And then that means you can look at the different morphological characteristics– so how the body looks. And that can include everything from its internal skeleton to how many little fin rays it has on its left fin kind of thing, right? And how many spines it has on its right leg. And then on top of that, normally now, we’ll take a little bit of tissue, which we can sequence to look at its DNA. And we can compare that with other known species. And then using both the morphological and molecular characteristics, we can definitively say whether it’s a new species or not. IRA FLATOW: Wow, that’s great. And we have incredible sights from your deep-sea expeditions on our website, plus a whole swell of stories about the ocean, a submarine pilot who helps film “Blue Planet,” an aquarium that grows coral, and much more to come, much more to come as we celebrate World’s Oceans Month. Find it all at sciencefriday.com/oceansmonths. So we’re gonna take a break. And we’re gonna come back and talk a lot more about underwater drones now that might help us map the deep and might sniff out shipwrecks and whale falls and hydrothermal vents. The deep ocean is going autonomous. Just like our cars are headed that direction, so are we in the deep oceans. Diva will be back. We’re also gonna bring on other guests. So stay with us. Lots more oceans talk after the break. This is Science Friday. I’m Ira Flatow. We’re talking about exploring the deep oceans with my guest, Diva Amon, a marine biologist and research fellow with the Natural History Museum in London. And just as drones and robots are taking over exploring the skies, the roads, and the planets, drones and robots are diving and exploring underwater, too. In fact, XPRIZE has challenged roboticists to design autonomous underwater vehicles that can explore the deep more cheaply than the ships we use today. And they announced nine finalists in the Shell Ocean Discovery XPRIZE competition in March. We’re going to bring on one of the finalists. Martin Brooke is leader of the Blue Devil Ocean Engineering Team at Duke University and associate professor of electrical and computer engineering there. Welcome to Science Friday. MARTIN BROOKE: How are you? MARTIN BROOKE: I thought I was not coming on first. IRA FLATOW: Well, I’m gonna bring on someone else. Jyotika Virmani oversees the competition. She’s senior director for a planet and the environment at XPRIZE. Welcome to Science Friday, Jyotika. JYOTIKA VIRMANI: Thank you, Ira. It’s a delight to be here. IRA FLATOW: Martin being a little bit shy, I’m gonna talk to you first. Tell us about the challenge. What do teams have to do to win that $7 million prize? That’s some prize. JYOTIKA VIRMANI: Was that for Martin? IRA FLATOW: Yeah, that was for you. JYOTIKA VIRMANI: Oh, me. OK. Yeah, I’m sorry. Hi, Martin. MARTIN BROOKE: Hi, Jyotika. How are you doing? JYOTIKA VIRMANI: Good. So the $7 million Shell Ocean Discovery XPRIZE is a competition in which we are incentivizing brilliant innovators from around the world to map the seafloor, the deep seafloor that you’ve just heard about, at very high resolution. And they have to do it autonomously. They have to do it quickly. There’s no ships in the competition area. And in addition to mapping the seafloor, they have to bring back images from the deep sea. And in addition to all of that, we have a $1 million bonus prize in there from the National Oceanic and Atmospheric Administration for pioneering technology, which is an autonomous underwater smart sniffer, so technology that can detect a chemical or biological signal underwater, and then autonomously track it to its source. So that all combined is a super exciting competition. IRA FLATOW: You know, I find this very much like NASA sending robots to distant planets instead of people now. You’re doing sort of the same thing with the oceans here. JYOTIKA VIRMANI: Yes. That’s exactly the model that we are using, in fact. One of the market failures and one of the reasons why the entire seafloor has not yet been mapped at a high resolution is because it’s so expensive to send ships at sea. And so just like NASA sends robots to other planets, these robots will go out to the deep ocean. And we will stay on land at what we’re calling mission control. IRA FLATOW: There you go. Martin, now tell us about your project. It’s an aerial drone, right? MARTIN BROOKE: Yeah. So at Duke, I teach design classes in electrocomputer engineering. And we were always looking for something really exciting and challenging to motivate the students and sort of give them the reason to want to really do well in the class. And the XPRIZE has been serving up these incredibly challenging and interesting projects that we’ve just really enjoyed being part of. IRA FLATOW: So you lower this pod onto the ocean? IRA FLATOW: And what happens? MARTIN BROOKE: And the drone flies out, drops the pod onto the ocean, and flies away and leaves it there. And then what the pod does is lowers a synthetic aperture sonar system down deep enough that it gets under the thermocline layer and all the problems that we have with wave guiding and sonar. And we can actually do synthetic aperture sonar mapping down deep with a relatively low-cost system. And then once you’re back out, literally we’re using fishing line. We have 4,000 meters of 50-pound test fishing line that’s used for deep-sea fishing to winch this down and up. And we tested it a while ago off the coast of North Carolina, and it was working OK to do this. And that gets us a really low-cost system that doesn’t use a lot of power. And when it’s done collecting the data for the mapping, it pulls its pod back up and signals for the drone. The drone comes back and picks it up. And there’s hopefully multiple of these pods. So we’ve planned to build, like, 10. And so the drones are flying around, servicing all these pods, dropping them and mapping, dropping them and mapping. IRA FLATOW: And why do you need to drop them? Why do you have to lower them down? Why not just do the sonar mapping from the surface? MARTIN BROOKE: Well, there’s’ this layer– I think it’s called the thermocline layer– that varies between 600 meters to 1,000 meters down. And I’m not actually an ocean scientist. I’m an electrical engineer. So I could be getting this wrong. Hopefully Jyotika will correct me if I’m wrong. And what it does is it tends to waveguide sound. And sound is by far and away the best way– I mean, dolphins and whales have figured this out. It’s the best way to see in the deep ocean. Light doesn’t go very far. And radio waves don’t penetrate. And so sound will propagate really well. And we hope that our system, once it gets below that thermocline waveguiding layer that sort of blocks sound from getting very deep, will be able to map about 1,000 meters out from itself. And so we’ll get a reasonably good chunk of mapping just from that one sonar pod. And then we move it on and on, and get different results. But you have to get down below that thermocline layer before you can do something. IRA FLATOW: I’m getting the picture. Well, congratulations to you, and thank you for taking time to be with us today. MARTIN BROOKE: Sure. Thank you. IRA FLATOW: Martin Brooke, leader of the Blue Devil Ocean Engineering Team at Duke and associate professor of electrical and computer engineering over there. Still with me are Diva Amon and Jyotika Virmani. So was he right about the thermocline, Jyotika? JYOTIKA VIRMANI: Actually, the thermocline is quite shallow. It’s usually in the upper 100 or so meters. And it’s a temperature gradient. I think he’s referring to the deep scattering layer, which is also sometimes called sound scattering layer. So there is essentially a sound barrier there down there. IRA FLATOW: Diva, speaking of how expensive these research vessels, the big ones, are to send down, it seems like something only richer countries can afford to do in the first place. But does Trinidad and Tobago have their own deep-sea research program? And would they love to have what they’re working on, what Martin is working on? DIVA AMON: Country would love to have them. But the reality is that only about, I think 70– around 70% of nations have deep oceans within their maritime exclusive economic zone. And only about 16% of them are able to explore these environments. And Trinidad, of course, is not one of them. This is especially true for the less economically developed countries. IRA FLATOW: Hmm. And Jyotika, NASA and the space program have no problem inspiring people over the years with the moon missions, the Mars missions, the flights to Pluto. You mentioned this is sort of exactly the kind of project NASA knew about and thought about, sending robotics. I don’t know if people feel the same excitement about exploring the ocean, but maybe this could get them excited about what’s going on. JYOTIKA VIRMANI: Yeah. This is our opportunity to discover a new planet. It’s only 4 kilometers away, but as Diva described and you’d mentioned, there’s some weird and wonderful creatures, and alien creatures at that, down there. And the landforms, we’ve not yet fully explored what’s out there. There’s thousands of seamounts yet to be found and cliffs that are thousands of meters in height. So this is a new planet. And we can inspire the public by casting it in that light. We’ve done some work around this topic exactly to look at how to inspire the public. So there isn’t any differences in how the space community talks about space and the ocean community talks about the ocean. But using that NASA model is really good. IRA FLATOW: You know, Diva, years ago, Jacques Cousteau had us all enthralled on TV almost every week in “National Geographic” specials about exploring the oceans. Do you think we need something like that to explore our own planet, something that is very public, people can see what’s going on? DIVA AMON: Absolutely. It’s all about democratizing our deep oceans. And that not only involves exploring them more, but also communicating that, Jyotika was just saying. We’ve not been very good at that because we know so little about it. But there’s this huge push now to explore our oceans, to understand them better so that we can manage them better. And as a result, we should be better at communicating it. It’s an amazing, inspiring place, the deep ocean, and we should really be sharing that with as many people as possible. IRA FLATOW: I remember Bob Ballard’s Nautilus project, where he would get kids involved in watching deep exploration under the water. DIVA AMON: Absolutely. So Bob Ballard’s project, the Ocean Exploration Trust, which runs the Nautilus, as well as NOAA’s Office for Ocean Exploration and Research. Their ship, the Okeanos Explorer, are two of the leaders in this. They live stream all of their dives from their ROVs so you can be sitting in your house anywhere in the world once you have an internet connection. And you can be watching live what those ROVs are seeing, wherever they are in the world, at that exact moment. You can be following along with scientists, hearing them, hearing their narration, hearing them exclaim that they’ve seen a new species, and follow along and be that explorer with them. They’re incredible programs. IRA FLATOW: Jyotika, Diva mentioned earlier how the resolution of the ocean floor is so large. It’s like a whole city in one spot that we don’t know about. Do you think that your kind of exploration could help us map those cities or increase that resolution much higher? JYOTIKA VIRMANI: Yes, absolutely. So the competition itself is looking at 5-meter horizontal resolution. Diva earlier had said 5-kilometer resolution is what we have for almost the entire seafloor at this point. So that’s a huge leap forward. There is an international effort underfoot to have the entire seafloor mapped around 100-meter resolution by 2030. If you took the technology that we have of today, the estimate is that it would take somewhere around 600 years to get that kind of a map. And so the technology that’s coming out of the Shell Ocean Discovery XPRIZE is really going to help in us achieving that 2030 goal of mapping the seafloor at a high resolution, which will feed back into exactly what Diva was talking about, the ability to find out what’s out there, to discover smaller features and hydrothermal vents much more quickly and much more cheaply. IRA FLATOW: Does that excite you, Diva? DIVA AMON: Absolutely. I mean, the dearth of technological capability and knowledge that exists worldwide with regard to our deep ocean means that inappropriate or inadequate management decisions are being made, that we have unaware populations. 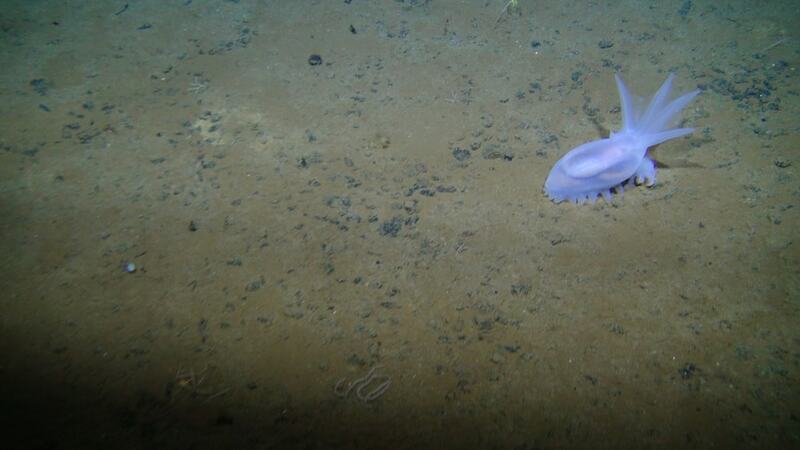 And just generally, I think the world would be a much better place if we knew more about our deep ocean. IRA FLATOW: I’m Ira Flatow. This is Science Friday from WNYC Studios, talking with Jyotika Virmani and Diva Amon about deep-sea exploration. Did I hear you say you think you can get the whole thing done by 2030? JYOTIKA VIRMANI: Yeah, there is a global movement, Movement Seabed 2030, which is not just the XPRIZE, but there’s a number of other organizations and entities involved with this, to get the whole seafloor mapped by 2030 at a high resolution. And then going back to something else that was mentioned earlier about being your own explorer and following along with the Okeanos Explorer or the Nautilus, one of the aspects of this competition is imagery. And we didn’t specify when we launched this competition what kind of imagery we were looking at because the field of virtual reality is changing so incredibly quickly that it’s conceivable that we would have a number of avenues in which we can explore the ocean, including virtual reality, in the next few years. IRA FLATOW: Wow, virtual reality. That would be something, to get to see all of this. IRA FLATOW: Let me give you the other side of the coin here. And that is by making access to the deep ocean cheaper and more democratic, won’t we also open the oceans up to unwanted exploitation where you can maybe killing the stuff that you’re going to discover? 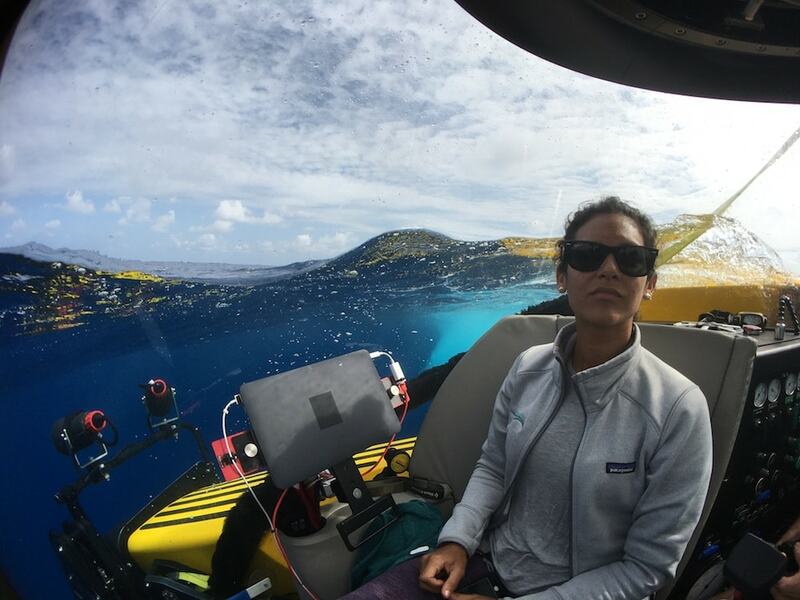 JYOTIKA VIRMANI: Well, I think what we’re really going to do is open it up to allow deep-sea environmental management, which Diva’s touched upon a couple of times, which will give us the insight to see what’s going on down there. Right now, it’s so expensive that we don’t have global eyes on what’s happening down there. So we want to open it up for deep-sea environmental management, deep-sea conservation, even deep-sea ecotourism. IRA FLATOW: Deep-sea ecotourism. Well, you know, that goes along with the space model, doesn’t it? IRA FLATOW: I mean, that’s interesting. There aren’t very many submarines that take people down to see what’s down there. Are there any that you know of? Diva? Jyotika? DIVA AMON: There are a couple, yeah. So I know that you can pay, for instance, the Mirs, which are the Russian ones, as well as there are a couple shallower ones. And it seems to be a thing nowadays where a lot of philanthropists tend to have a super yacht, which they will also make available for research. And these super yachts tend to be equipped with submersibles, which are amazing, and very generous of them. IRA FLATOW: Mhm. So– I’m sorry. Go ahead. Did you want to say something? JYOTIKA VIRMANI: Oh, yeah. I was gonna add to that, though. In addition to people actually going down in the submersibles, with something like virtual reality, you could sit, put a headset on, and turn around and look up and down and get a whole new experience of the ocean from your living room, basically. IRA FLATOW: And when am I going to see this? JYOTIKA VIRMANI: Come over to XPRIZE, and I’ll show you. IRA FLATOW: [LAUGHTER] That’s for me. But how about everybody else who’s listening? JYOTIKA VIRMANI: I think these things are coming online. I think we’ve seen this in the gaming industry and in other industries, how they’ve really taken to different kind of visualization. And I think that’s now spreading. I know in the medical industry, they’re taking that on for things like heart surgery. And so this is something that is probably going to be online for the ocean world in the next year or two. IRA FLATOW: One last question to you, Jyotika. Coral reefs are one of the most talked about endangered habitats in the oceans. Are there any plans to mobilize people around some sort of coral reef XPRIZE? JYOTIKA VIRMANI: That’s a fantastic question. Yes, actually. We have just launched, actually, five prize design ideas through a competition on our sister platform, HeroX, one of which is saving coral reefs. So if anyone out there has an idea of a competition design to save coral reefs, I highly encourage you to go onto our HeroX platform. Another one on there is a natural disaster prediction XPRIZE. And I know today is the first day of hurricane season. So we’re also looking at how can we improve the prediction capabilities through an XPRIZE and bringing in some of this exponential technology. IRA FLATOW: I hope we fittingly kicked off National Oceans Month. I want to thank both of my guests, Jyotika Virmani, who is senior director for planet environment at XPRIZE. Jyotika Virmani, thank you for taking time to be with us today. JYOTIKA VIRMANI: Thank you very much, Ira. It was such a pleasure. IRA FLATOW: And Diva Amon is a marine biologist and research fellow with the Natural History Museum in London. Diva, thank you for taking time to be with us today. DIVA AMON: My absolute pleasure. Thank you, Ira.